National pet charity, Blue Cross, is celebrating its 120th anniversary this year and for the first time in its history will be airing a brand new TV advert to highlight how gifts in wills support pets in need. 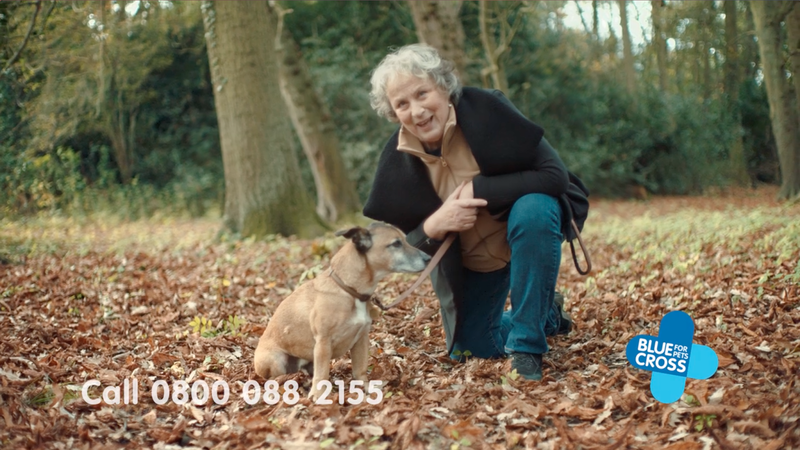 The charity’s rehoming ambassador, actress Pam Ferris, fronts the advert accompanied by a Blue Cross rescue dog, letting viewers know how the money could help care for pets and how she has herself pledged to give to the charity in her own will. Airing from the 15th November this advert was created by communications agency LIDA. LIDA have worked with Blue Cross for a several years including creating a multi-channel campaign to increase awareness of Blue Cross and drive donations. The narrative follows the thread of how pets uniquely change our lives in a variety of enriching and special ways and how Blue Cross exists to change theirs. Over 50% of the charity’s annual income year on year in from gifts in wills and this new creative is a way to highlight to audiences considering a legacy tribute how much of an impact it will have for pets in need and support the work of the organisation’s rehoming, clinical, behavioural and education work. “With over 50% of our total income coming from legacies year on year, it is important Blue Cross is able to show people just what an impact a gift in a will can make for pets in need. We wanted to create a unique, positive journey for viewers with this advert demonstrating the wonderful legacy anyone can leave to help countless pets in the future.